I’m a fraud when it comes to anything and everything related to Thai food. My tom yam soup has come from the frozen aisle of Trader Joe’s and my pad thai has been take out from the Thai restaurant down the street. Lanta Thai Cookery School took a gamble on a Chicago city couple in that they could teach us to cook, while convincing us that it was easy enough to do in a small one bedroom apartment back in the US. The day was spent chopping vegetables, cooking over hot woks, and tasting the fresh and spicy Thai food we cooked ourselves. All of the herbs and spices used in their classes are grown in their own garden out front almost always picked that morning, so you know they are fresh. Although Trader Joe’s will be back in my life in Chicago, I am a believer that fresh Thai food is easy and worth the amount of prep work it takes to cook. We were picked up bright and early at 8 AM and driven to the beautiful Thai teak house, along with 8 other people. The morning started with a list of ten dishes and our first group assignment was to pick four to prepare that morning. It was tough since we wanted to learn to cook them all, but four hours just isn’t enough. We stuck with the basics that everyone comes to Thailand to try, Tom Yam, Phad Thai, Stir-Fried Chicken with Cashew nuts and Panang Curry. Each spice was explained to us in detail, not only how you could use it in cooking, but how you could use it to make soap or shampoo (you can imagine I was taking notes.) I was caught off guard when I was supposed to know what lemongrass or galangal looked like (or even was.) It quickly reminded me how much I don’t cook in Chicago. We chopped and minced the ingredients together, and separated them into different piles in each dish’s bin. Once the prep work was done, Chien went right to work heating up the wok and going step by step through the process before allowing us to prepare and taste on our own. The smells were enough to melt your face off, even if you didn’t like Thai food going into the course, you will leave craving it. The dishes were all pre-chosen but you were able to pick chicken or seafood (prawn and squid) for your Tom Yam and 1, 2 or 3 chilis to spice up your meal. Once the basic concepts of how to prepare it were explained and it was just you and your wok, you had the ability to add more or less sauce, veggies, or any ingredient to customize the taste to how you like it. Chien was patient with all of us and fun to talk with but he did not take his job as teacher lightly. He informed us how each particular ingredient would contribute to the “good smell, good taste” of the dish, and how it all fit together to make the perfect meal. If anyone complained of being full he reminded them that we weren’t there to eat we were there to learn. I was quickly full after the first dish and was glad when they brought out take-away bags for our leftovers. The meals ended up being our breakfast, lunch and dinner for the day! After learning only the 4 dishes, we already wanted to go back for a different course and learn more dishes. I was amazed at how simple they were and how important the fresh ingredients are to the taste of the meal! 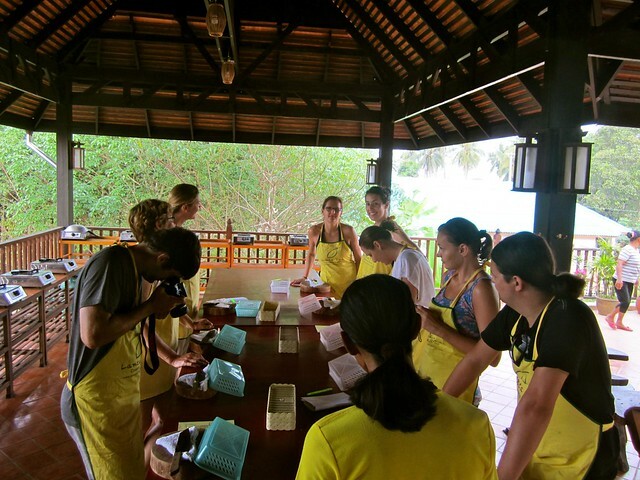 Disclosure: We were sponsored guests of Lanta Thai Cookery School. As always, all opinions are our own. This sounds like so much fun. Mom will be jealous :). You guys better make us some yummy thai at home some day! all of the items sound great but is there any gluten involved?